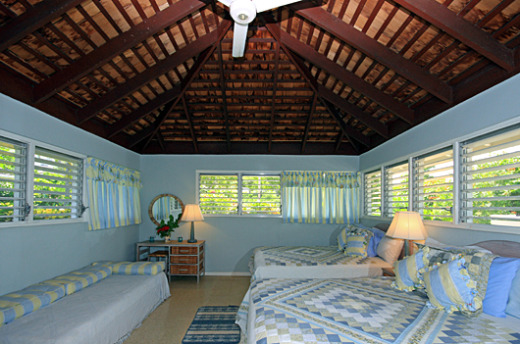 Image 1 of 13: Ebb Tide Cottage is located on the sea front at Silver Sands Jamaica. 2 of 13: A spacious patio lines the seaside of Ebb Tide. 3 of 13: Large Dining and Living Room with sea views. 4 of 13: Lounge area in the Great Room. 5 of 13: Dining table, close to the kitchen. 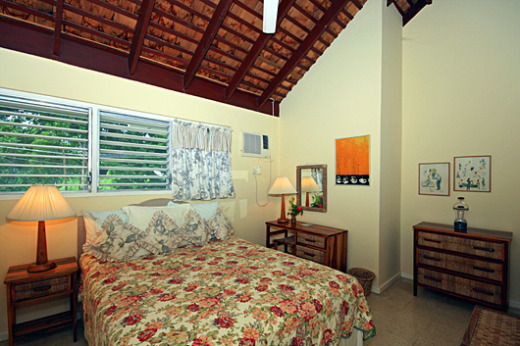 6 of 13: Bedroom 1 is furnished with two double beds. 7 of 13: Bedroom 2 is furnished with a king size bed. 8 of 13: Bedroom 3 is furnished with twin beds. 9 of 13: Bedroom 4 is furnished with a queen size bed. 10 of 13: Enjoy the view of the Caribbean Sea from the Patio. 11 of 13: Nothing but a lawn and grassy field separates Ebb Tide from the Caribbean Sea. 12 of 13: Relax on the garden bench and enjoy the sea view and tradewinds. 13 of 13: The television area is situated on the Eastern side of the Great Room. 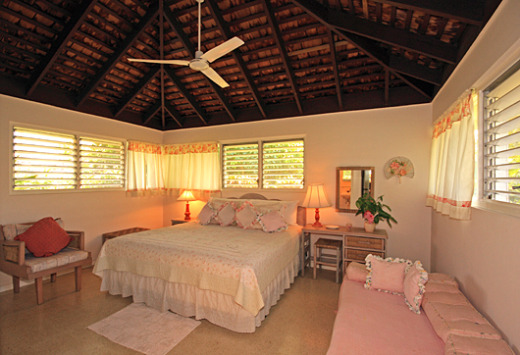 Ebb Tide is a luxurious and spacious 4 bedroom cottage situated right on the beach at Silver Sands. 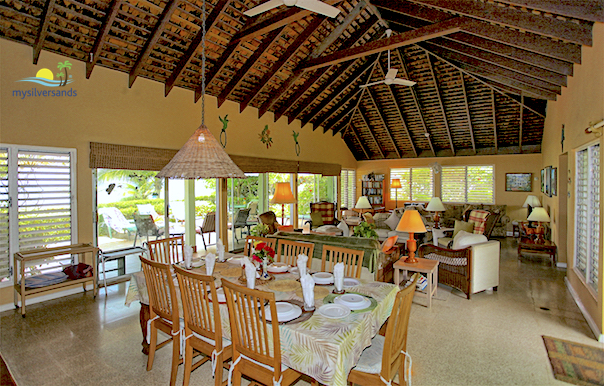 All that separates this large family beach house from the turquoise waters of the Caribbean Sea is a well-maintained lawn dotted with coconut trees. It’s the perfect spot for a traditional beach vacation, very suitable for families or a group of friends. Ebb Tide is a great place to relax and base oneself for exploring all that Jamaica has to offer. Large patio beside the beach where you may sunbathe or relax in the shade of a trellis with pretty hanging flower baskets all around. Very large living and dining room, making this house very comfortable for a big group. Equipped with VCR, Cable TV, and portable CD player, radio, cassette stereo,telephone. 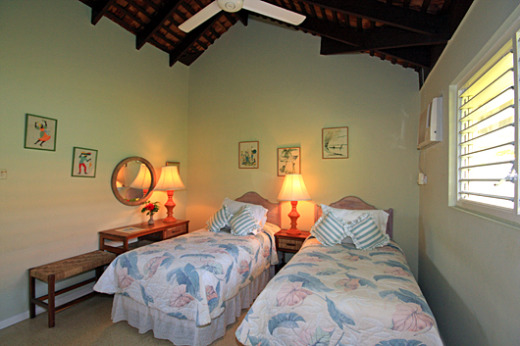 Every bedroom is comfortably furnished and there are two with an extra day bed each, suitable for small children. All bathrooms have showers. Master also equipped with a tub. Cook & Housekeeper. Staff are flexible and will serve all meals on request. A child's pack 'n play and a toddler's booster seat are available. Ebb Tide costs from $332.00 to $548.00 per night. If available, you may book this property for periods beginning 7 days from today. 2018 - Any booking including the dates Friday, March 30, Sunday, April 1 and Monday, April 2 (Good Friday, Easter Sunday and Easter Monday) must be for a minimum of 7 nights. 2019 - Any booking including the dates Friday, April 19, Sunday, April 21 and Monday, April 22 (Good Friday, Easter Sunday and Easter Monday) must be for a minimum of 7 nights.